Unspoiled, natural beauty is a great way to define the basic identity of large parts of Michigan. Even as far back as 2010, the state was increasingly trending rural according to census data from that year, which showed population losses from the cities and gains in the more rural areas. Campgrounds are fairly easy to find, both in small, back-yard scale and large sites maintained by the state or a private enterprise. Those who want a rustic evening under the stars or a great place to park the RV for the night will have no shortage of places to settle in. 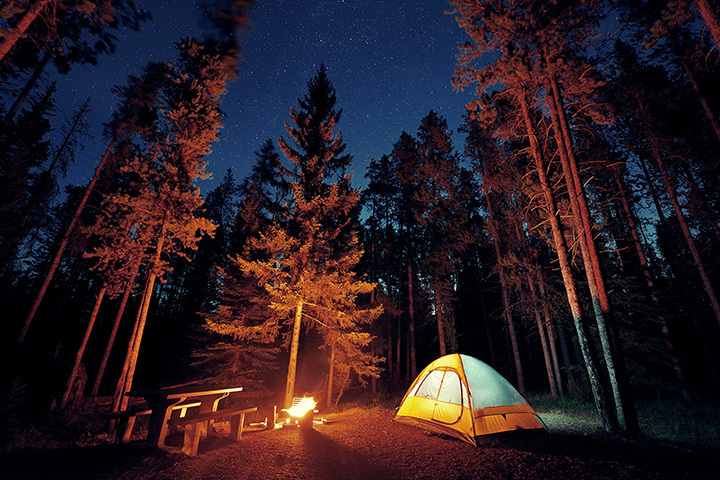 So with that in mind, fire up the s'mores and get ready for a night as peaceful as you'd like it as we run down 10 great Michigan camping spots! A more recent addition to the roster, those looking for a newer campground will find it in Dunes Harbor Family Camp. Offering 60 waterfront campsites just for a start, your chances of landing a spot near the water are fairly high at any given time. With Silver Lake's sights close to hand, and the local sand dunes also afoot, those wanting a little quiet time with the family will find plenty of room and plenty of exciting sights nearby. Muskegon's own Pioneer Park should likely prove a welcome place for families to set up camping arrangements for several reasons. Its proximity to Lake Michigan should prove a welcome sight for families who enjoy the water, and the city of Muskegon is likewise nearby for those who can't quite pass up the treats only a larger urban area can offer. Perhaps best of all, last-minute campers can take off on the spur of the moment as the site reportedly doesn't require reservations. Water is the biggest draw for Platte River campers, near Honor. Those who start out for a ride on the river, whether canoeing, kayaking or just tubing, will shortly find themselves in the wider waters of Lake Michigan without much incident. A half-mile trail walk from the campground will likewise make Lake Michigan's boundaries available, and the campsite itself is located near not only the Sleepy Bear Dunes, but also near Glen Arbor and even about 40 minutes from Traverse City, which will open up a huge variety of activities for those interested. Activities are the focus of the day at Sandy Pines as the campsite contains not only a water park but also a ropes course, both miniature and regular golf, and several sports from tennis to basketball to lesser-known favorites like dodge ball and gaga ball. Its location allows easy access from a variety of points in Michigan, and with so much to do, even the fussiest kid isn't likely to get bored any time soon. In Breckenridge, campers get access to an upscale experience. Naturally, it's got a slate of family activities going for it, but there's plenty more going on here. Its proximity to the river offers the simple pleasure of listening to water sounds all night if so desired, and not only does it have a pool and a spa, but it also boasts a pond with water trampoline. Jungle gyms and aqua slides help ensure that those with energy to burn will do so in grand fashion, while those craving a more restful time will likewise lay hands on it. Normally the ideas of “camping” and “Metro Detroit” don't go together all that well, but Michigan is a state that constantly defies expectations. About an hour's drive or so, out on Cook Lake, is Taylor's Beach Campground, a campsite consistently rated one of Michigan's best. Offering a variety of terrains for hiking, swimming and fishing, and a variety of packages—including a yearly site rental option—Taylor's Beach will offer a getaway no matter how close one lives to Metro Detroit. Featuring almost 40 individual campsites, AuTrain Lake in the Hiawatha Natural Forest offers not only a string of activities like swimming and boating, but it's also said to be an excellent spot for bird watchers to settle in and check out the local wildlife. Perhaps best of all are the sunset views from the shore; the mirror finish of AuTrain Lake gives sunset viewers two sunsets for the price of one. Sunrise viewers likely won't go unconsidered here, either. Camping on an island, for some, may evoke images of grand and romantic adventure, but it's available right here in Michigan thanks to Beaver Island Hideaway Campground on Beaver Island. Completely surrounded by Lake Michigan, the island offers hiking trails and roads, along with beaches nearly everywhere—when you're on an island, all you really need to do to find a beach is pick a direction and walk until your feet get wet—and fishing, camping on Beaver Island can be a great option. Throw in the annual Beaver Island Music Festival—next year's festival is July 20-22—and campers will have no shortage of options. Sixty thousand acres. Let that sentence fragment settle on your brain for a second, and then prepare for your mind to be further blown when I tell you that that works out to just shy of 94 square miles. This absolutely massive camping location is waiting for you at the Porcupine Mountains, an area comprising those 60,000 acres of hiking, mountain biking, swimming and camping in the midst of some of the most unspoiled wilderness Michigan can offer. Natural beauty abounds, and rustic camping enthusiasts will find plenty to love. Those looking for a natural camping experience outdoors won't go wanting with Huron-Manistee National Forest. With canoeing on hand on the Pere Marquette River and fishing on Benton Lake, along with swimming, a good time with water is available in abundance. Beyond that, though, a host of natural wonders awaits ranging from fens, bogs and marshes to dry sand prairies and dunes. Go wandering among the Jack Pine trees and enjoy all the rest of the undiscovered wonders this place has to offer. That’s a rundown of just 10 great Michigan camping spots, and the good news is, for each of these 10, there’s another 10 waiting to be had. Campsites with a wide array of features, amenities and natural beauty are readily available. Whether you’re parking your RV or pitching your tent, Michigan’s waiting for campers.